It is successive cool summers and the persistence of snow and ice from one winter to the next which will cause the next little ice age. Of course the absence of summer in the highlands of Lapland and Scotland in 2015 does not necessarily mean that an ice age is upon us. But in the language of “climate science” (which is no science), it is entirely consistent with the coming of an ice age. This year we have had a fairly miserable summer in Sweden but in the highlands of Lapland, conditions have gone directly from a “meteorological spring” to “meteorological autumn”. And even in the Scottish Cairngorms snow from last winter is still persisting and creating some impressive sculptures as it melts. Telegraph: Low summer temperatures mean snow continues to cling to the mountainsides of the Scottish National Park, even in the middle of August. But as the patches begin to melt from below, and water flows downhill, vast caverns – some big enough to walk through – are formed. These striking pictures were captured by Helen Rennie at Ciste Mhearad in the northern Cairngorms. In Lapland, the highlands have officially skipped summer and gone directly from spring to autumn conditions. There was no summer this year in the Tarfala highlands of northern Lapland. They have gone from meteorologic spring to autumn without going through any summer according to the temperatures says SMHI meteorologist Sandra Andersson. “If the summer has not formally come by 1st August we can go directly to autum instead and so it was for Tarfala” says Sandra Andersson. How common is it to skip a season? “In the highlands it happens occasionally. Even Falsterbo in Skåne (southern Sweden) have sometimes skipped winter but it is not so common”. Even in Stekenjokk in the southern highlands of Lapland it is is now officially autumn, which means that the average temperature during the day after 1st August did not exceed ten degrees for five days in a row. 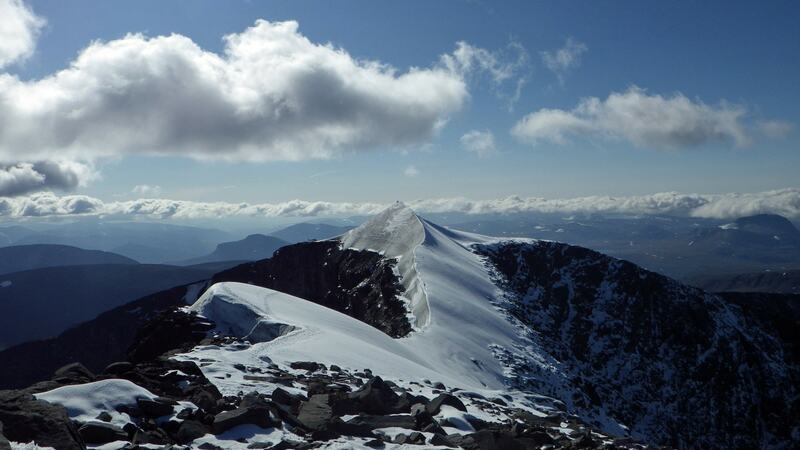 Southern top of Kebnekaise Foto: Stockholms universitet. The Great Lakes ice cover on 7th February had reached 78% and will continue increasing in the coming days – at least until the 3rd week of February (Source: NOAA). The increased ice coverage on the Great Lakes this winter is good news for water levels on the lakes, which are still struggling to recover from some record lows recorded at this time last year. During January 2013, water levels on Lake Michigan and Lake Huron fell to their all-time lowest values since record keeping began in 1918, 29 inches below the long-term average. While the water levels recovered substantially during 2013, which was one of the wettest years in Michigan’s history, water levels were still a foot below average at the beginning of 2014. The above average ice cover this winter will reduce evaporation from the Great Lakes, keeping water loss lower than in recent winters. I suppose one can have too much of a good thing and that being completely frozen for too long a time is not a “good thing”. If there is a global warming (or global cooling) signal in this chart – I can’t see it. The natural variations are of an amplitude which hides any such signal – if it exists. Whenever weather observations – however extreme – are still within the envelope of what has been observed before it only shows that such observations are not unprecedented and must be taken as to be within natural variations. And if what is observed has also been observed before the industrial revolution – say 200 years ago – then industrialisation cannot be blamed. Ice continued to build this past week on the Great Lakes due to the cold air and temperatures staying below freezing, and Lake Superior’s new record shows it. Lake Superior is almost frozen over as of yesterday February 5, 2014. Lake Superior is 92 percent covered with ice now. The ice has increased rapidly in the past week, from 76 percent ice cover on January 30, 2014. The high resolution satellite picture from February 3, 2014 shows all of the ice cover on Lake Superior. The current ice cover on Lake Superior is the highest amount ever for February 5. In 1994, Lake Superior was reportedly 91 percent covered in ice. Lake Michigan is now 51 percent covered with ice, as opposed to 42 percent at this time last week. Coyotes were seen walking on the ice just offshore of Chicago this week. This makes us wonder if the lakes freeze over totally, will animals from Canada be able to cross over Lake Huron or Lake Superior, and enter Michigan. It is thought that this is how the last wolverine spotted in Michigan made it into Michigan. Lake Michigan has been covered with more ice on this date in the past. In 1977 and 1996, Lake Michigan was up to 74 percent ice covered. Ice cover on Lake Huron rocketed up an additional 14 percent this week, climbing to a total ice cover of 86 percent. If the ice continues to build at that rate in this next week, Lake Huron could be almost frozen over, or frozen over by the end of next week. People ice fishing are reporting 24 inches of ice on Saginaw Bay near Bay City. Lake Huron has been as much at 95 percent covered in ice on this date back in 1981 and 1994. Lake Erie is the shallowest of the Great Lakes, with an average depth of 62 feet and a maximum depth of 210 feet. It also has the least volume of any Great Lake, with 116 cubic miles of water. So it should come as no surprise that Lake Erie currently has the highest percentage of ice cover. Lake Erie is 96 percent covered with ice. Last week at this time Lake Erie had 94 percent ice cover. Erie was entirely ice covered on February 5, 1996. Lake Ontario is an interesting lake. It is the smallest Great Lake when it comes to surface area, but actually holds more than three times the amount of water when compared to Lake Erie. The average depth of Lake Ontario is 283 feet, making it the second deepest Great Lake behind Lake Superior. The deepest spot in Lake Ontario is 802 feet. The ice cover on Lake Ontario is the lowest of any of the Great Lakes, with only 32 percent covered in ice. Last week at this time, Lake Ontario had 27 percent ice cover. Lake Ontario has been covered with as much as 79 percent ice up to this point in the winter in 1994. Winters and ice pose serious hazards for wildlife. 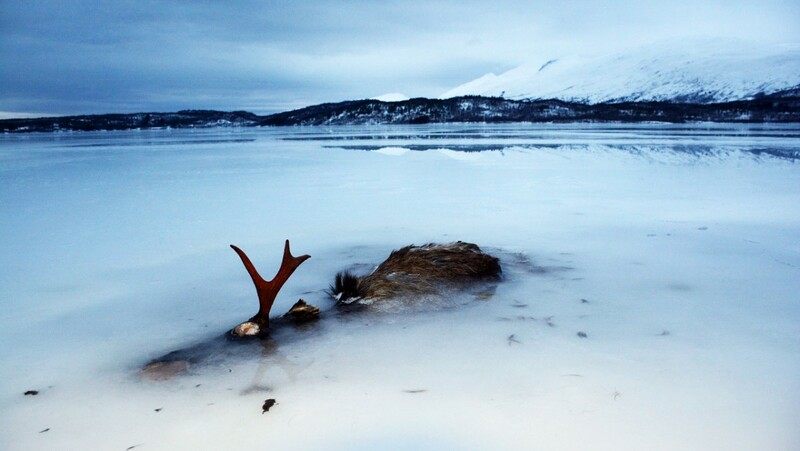 Closely following the pictures of a frozen shoal of fish and an elk in a frozen lake in Norway comes this picture from The Local of a fox found frozen in the ice on a lake in central Sweden. 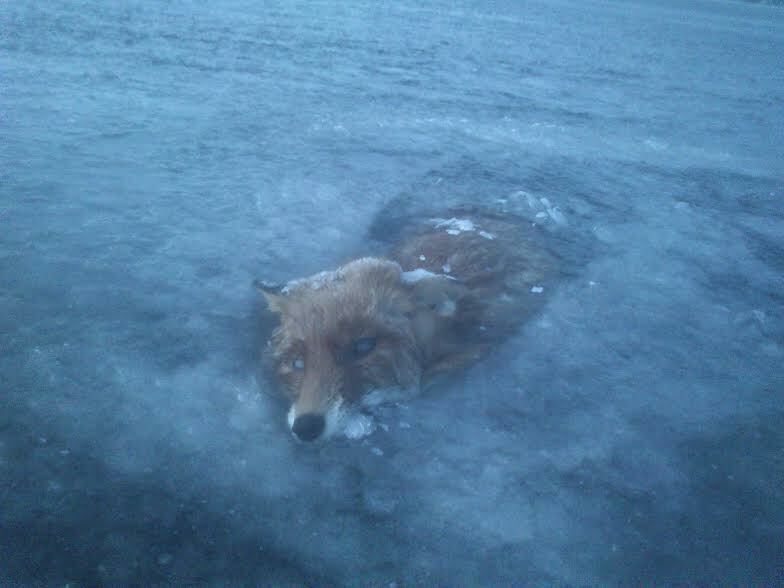 Presumably the fox fell through thin ice and then drowned or froze to death before being encased in the thickening ice. More pictures of the frozen fox here. Cold is a killer, warm is good! This Christmas was the mildest in about 10 years but things are getting back to normal winter conditions. We have now had plenty of snow and are currently going through another cold wave. In the north of Sweden temperatures dropped to minus 42°C. The usual chaos on the roads and with train traffic. My back hurts – as usual – after clearing snow from our garden path. Its only minus 12°C at the moment but thank goodness for electricity. It’s just weather and we may even come up – temporarily – to a high of 0°C sometime next week. But the days are getting longer and summer is surely on its way. Sunday night saw the lowest temperature of the season when Karesuando in the far north hit -41.9°C, but the mercury didn’t stop there. 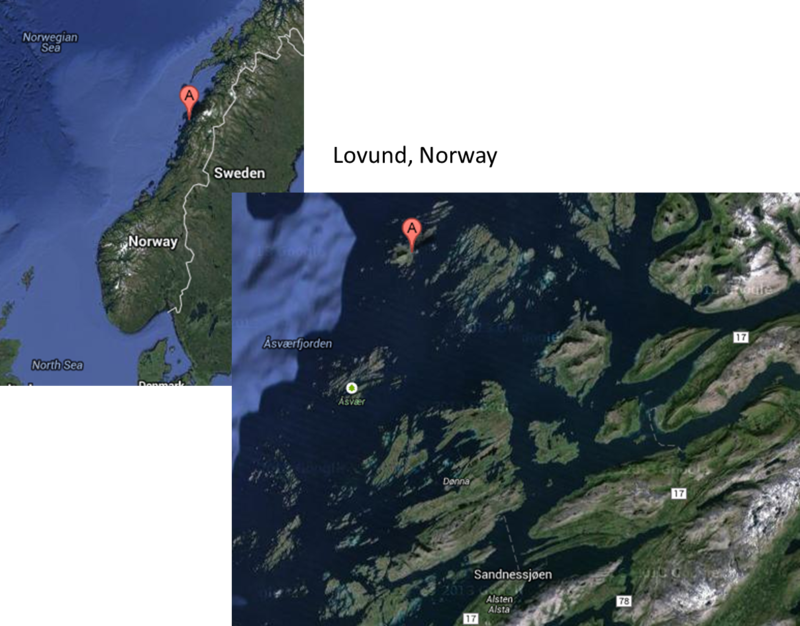 “It was -42.5°C in the early morning hours,” said Lisa Frost, meteorologist at Sweden’s weather agency SMHI. “The high pressure system is still hanging over northern Scandinavia. These temperatures are here to stay for the coming days. Fast freezing at its natural best. A shoal of herring was chased towards shore off the island of Lovund, Norway by cormorants. But the air temperature was – 7.8°C with a fresh Easterly wind and the sea froze so fast that the fish were trapped in “mid-swim” (or mid-flight)! Apparently the cormorants have not been able to get to them as yet. They will have to wait till the thaw — and that could be some time. It was minus 7.8 degrees and the east wind made ​​the bay freeze in a short time. The shoal of herring had been chased to the shore by cormorants, and apparently had not been able to get out into the open sea again, says Ingolf Kristiansen. He was on a Sunday outing with his miniature schnauzer Anton when he came across the unusual sight. “I’ve never seen anything like it. It has not happened before here as far as I know”, he said to NRK.no. 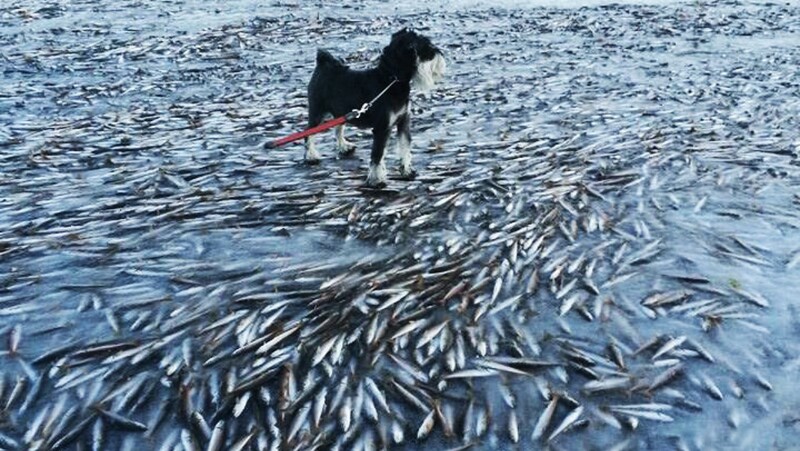 Aril Slotte, Head of Pelagic fish at the Sea Research Institute, says it was not uncommon for herring being chased ashore by predators. “We know that whales scares herring at various locations in Tromso, so it is not inconceivable that this could happen with small herring and other fish being pushed up against the land”, he said to NRK.no. In summer the bay is a popular swimming cove. A concrete wall has been built under water so that when the tide comes there is only seepage of seawater in from the open sea. …. Ultimately reality must prevail – even when it conflicts with what computer models may say. This from The Guardian ( which is still smarting from the Ship of Fools fiasco). Temperatures in all 50 US states dipped below freezing on Tuesday in a rare nationwide chill that will keep a grip on much of the country for at least another day, with cutting winds and blizzards posing the most danger. Florida, a state that normally basks in its reputation as a warm winter escape, experienced unusually low temperatures. In the midwest, northeast and eastern Canada, it was dangerous to venture outside. At some point on Tuesday, at least one location in each of the 50 US states recorded temperatures below freezing, with the highest point on Hawaii, Mauna Kea, recording a temperature of 21F (-6C). Snow has already come to Bavaria. Parts of Russia and the US have also seen some very early snow. Now, in just the 3rd week of October, snow has swept over northern Sweden. I have not had to clear any snow yet but I have had ice to scrape of the windshield for the last few mornings. I had only planned to change to winter tyres at the end of the month but I might have to bring this forward (to prepone it). It is only weather of course! I wish somebody could tell me of any effects of global warming that could actually be experienced. Snow and sub-zero temperatures hit widespread parts of Sweden on Thursday night and will carry on through Friday and beyond, with meteorologists warning motorists that now is the time to change to winter tyres. The coldest temperature of the season was recorded on Thursday night in Karesuando, in far northern Sweden near the Finnish border, where the mercury dropped to -12.5ˆC. 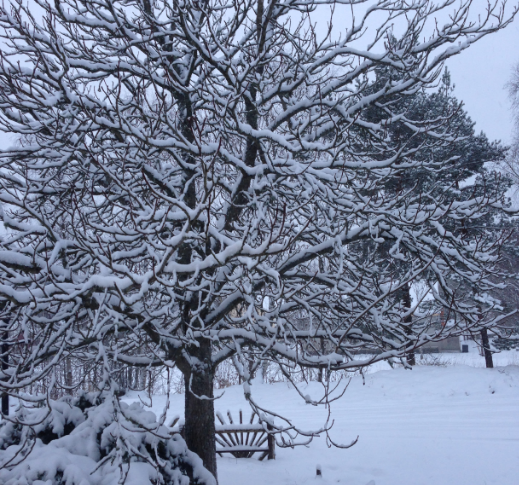 Snow fell in Västernorrland, Dalarna and Gävleborg, and in many areas further north, but experts said the snow is nothing to worry about. “I believe that in most places it’s only been a few centimetres of snow that have settled,” Sandra Andersson of Sweden’s weather agency SMHI told the TT news agency. SMHI issued a class 1 warning, stating that motorists should beware of slippery roads, although no damage was reported throughout the night. It’s only weather of course but the current winter in South America affords no evidence of global warming. The heat – if it is there – is extremely well hidden. 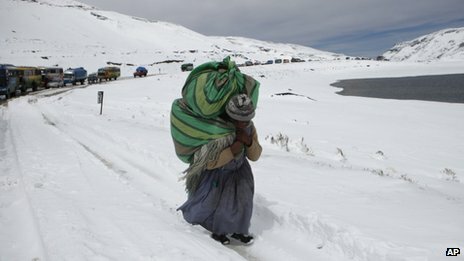 The Peruvian government has extended to nine more regions a state of emergency called to cope with unusually cold weather and heavy snowfall. At least two people have died and 33,000 others have been affected by the cold spell, local officials say. Tens of thousands of animals have frozen to death over the past week. President Ollanta Humala has travelled to Apurimac, one of the worst-hit areas, to oversee the distribution of emergency aid. The heaviest snow fall to hit Peru in a decade has killed tens of thousands of llamas, alpacas, cattle and sheep, and left farmers destitute. A man died when the roof of his hut caved in under the weight of the snow in southern Carabaya province but the circumstances of the second death were unclear. Three people were rescued on Saturday from the same region after their home was cut off by snow. Rescue workers said the three, two girls and an elderly woman, were suffering from frostbite and snow blindness. Just another Russian winter — or is it global warming? It is cold that kills not warmth. It is global cooling that will provide the greater challenge for humans – not global warming. But whether cooling or warming or both, humans will be better served by figuring out the best ways to adapt and not waste time and energy on trying to control the climate based on fanciful theories and religious beliefs about what causes climate change. Yesterday we had about -20°C, which is pretty cold but not unusual for this time of year. A friend in Australia was sweltering in +44°C -pretty hot but also not unusual. Another friend in Alberta had a normal winter day at about -25°C. Yesterday across the world humans were living and managing over temperatures ranging from about -50°C to about +49°C. Coping – quite successfully – with a temperature range caused by local weather of almost 100°C . On Friday, Moscow was on a verge of traffic collapse as more than 10 inches of snow fell on the city, which is more than half of January’s average. Thousands of passengers were stranded overnight in the capital’s major airports, as several dozen flights were delayed. Muscovites woke up and found their cars, driveways and houses buried under a thick layer of snow, with city workers unable to get to smaller streets. Banks of snow were as high as two people put together, reaching the second-story windows of some apartment buildings. Cars, stores, garages were blocked. Norilsk metropolitan workers were forced to dig passageways through the snow banks to create access between the outside world and the barricaded city. Meanwhile, icicles up to three feet in length have formed off the ledges of buildings, breaking at random and causing a lethal hazard for pedestrians below. Posted in Alarmism, Climate, Russia, Weather, Winter | Comments Off on Just another Russian winter — or is it global warming?